Falvey Memorial Library lost one of its most valuable and devoted librarians with the retirement of Susan Markley on May 30th after 35 years of service to the university. Serving most recently as the head of the Resource Management Team, Susan also worked on the Nursing Liaison Team teaching library skills to returning graduate students. Susan started at Villanova University in May 1979. She worked as the part-time Government Documents Librarian in the Technical Services Department until asked by the Library Director to assume the position of Head of Periodicals, a position she held for the next 27 years. Susan saw many changes during these years and recalled, “When I took over the management of the Periodical Department, the Library subscribed to approximately 3,000 print journals. 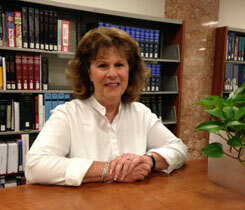 Today we have subscriptions and access to well over 10,000 mostly electronic journal titles.” In 2007, when the Periodical Department and Technical Services merged, Susan became the team leader for the newly created Resource Management Team, currently located on the lower level of the Library. Susan noted that her biggest challenge was converting the print journal collection to electronic format, tracking database payments, learning to deal with vendors, both domestic and foreign, and maintaining access to a growing print and electronic collection. However, her greatest pleasure was working closely with the various librarians and library staff. As part of her professional development activities, she was active in numerous local, state and national library organizations, including serving as treasurer for the Tri-State College Library Cooperative, secretary for the Association of College & Research Libraries, Delaware Valley Chapter, and as a board member of the College & Research Division of the Pennsylvania Library Association. Susan is a Philadelphia native and a graduate of the Philadelphia High School for Girls. She earned a B.A. in History from Boston University, a M.S. in Library Science from Drexel University and a M.S. in Liberal Studies from Villanova University. Before coming to Villanova, she was a librarian for the American Law Institute. She plans to continue spending time as a volunteer for the Women’s Resource Center in Wayne and to participate more in local politics. A long-time supporter of the Philadelphia Orchestra and the Philadelphia Museum of Art, Susan also plans to attend more of their special concerts and lectures. A world traveler, she and her husband, Tom, will be returning to Russia and the Baltic countries this summer and either Japan or India in 2015.